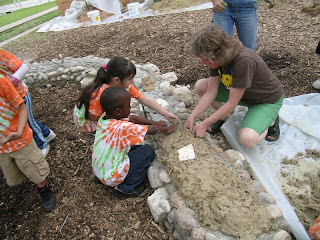 For the last couple of weeks, we have been preparing this lovely foundation to support a COB CATERPILLAR BENCH at Brentwood Elementary, where I am the ART teacher, and instigator of this project. Thanks mainly to CAJUN LANDSCAPING for all the mortaring expertise and long hours of donated time, and to Gayle Borst of DESIGN- BUILD- LIVE: an organization dedicated to natural building. Gayle is an architect who specializes in natural building...so wonderful to have an expert on the project! Her many hours working on the planning and coordinating of volunteers has been indispensable! 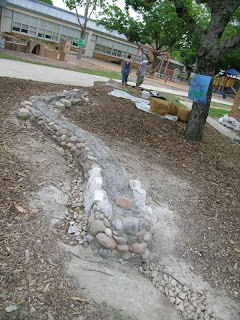 The foundation floats on a rubble trench. This HUGE art/building project, couldn't be completed without the many hours of volunteer help. 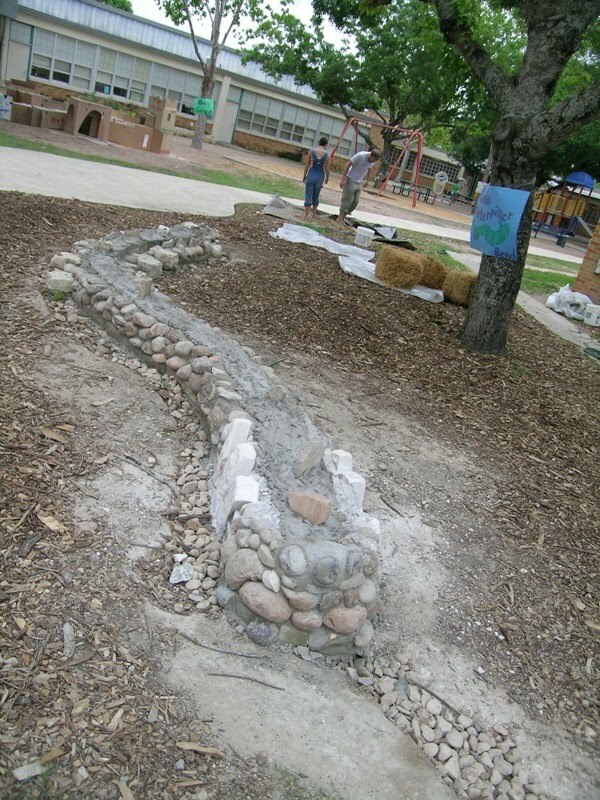 Besides Cajun Landscaping and Gayle, Jean Graham, neighborhood sculptor, designed the maquette and will sculpt the face of Mr. Caterpillar; Steve Ashley, sculptor and rock hound, donated the many fossils imbedded in the foundation, and the many cobbing volunteers from DBL. Look for more updates as this project proceeds! 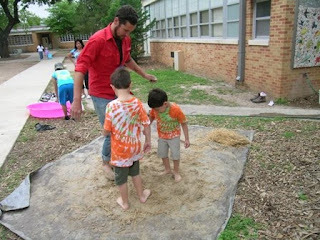 Future sessions include a sculpted layer of cob, plastering and 10 layers of linseed oil! We hope to have him finished by August. Story of the "KELPIE and the PRINCESS"
Now that I am retired and can do whatever I want, I find I fit a lot of daydreaming into my loose schedule. I write in the mornings, swim and walk in the early afternoons, and work in my art studio in the later afternoon, evenings and into the night. I'm afraid all this is broken up occasionally with errands and cooking and dishes, but I do make my writing and art a priority. My biggest passion is to be in books...to tell stories ...with words and art, to make books by hand, to create objects that tell stories: ALL THINGS BOOK.